Well, I wish I had a straight forward answer for you. Reading instruction is a constantly evolving process that involves so many different strategies. Many teachers have to teach a large variety of reading levels and create separate lesson plans for each of those levels. Within each of those levels, individual children have their own specific needs teachers have to accommodate. It is overwhelming. Therefore, we teachers have to be strategic and provide students with the tools and schema to help them be successful readers. Visor is a slick extension that helps with fluency, eye-strain, concentration and comprehension while reading online. 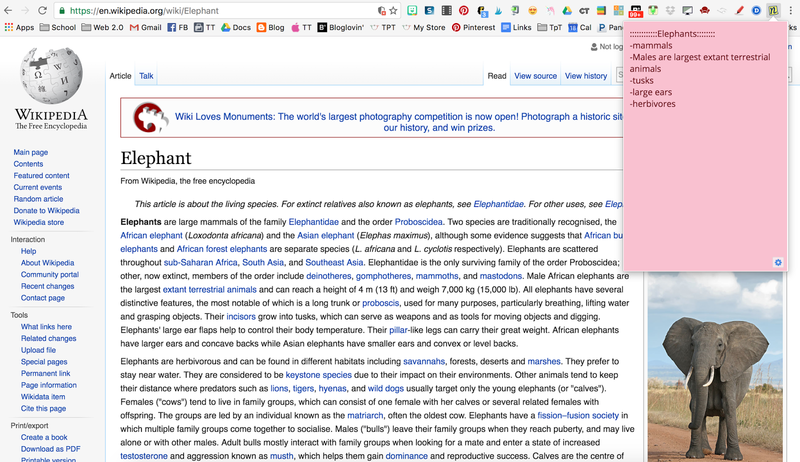 Once the extension is installed and you click the computer monitor icon, a colored overlay of your choice appears as well as a horizontal highlighter strip that employs a point of focus feature that helps with tracking as you scroll through text. 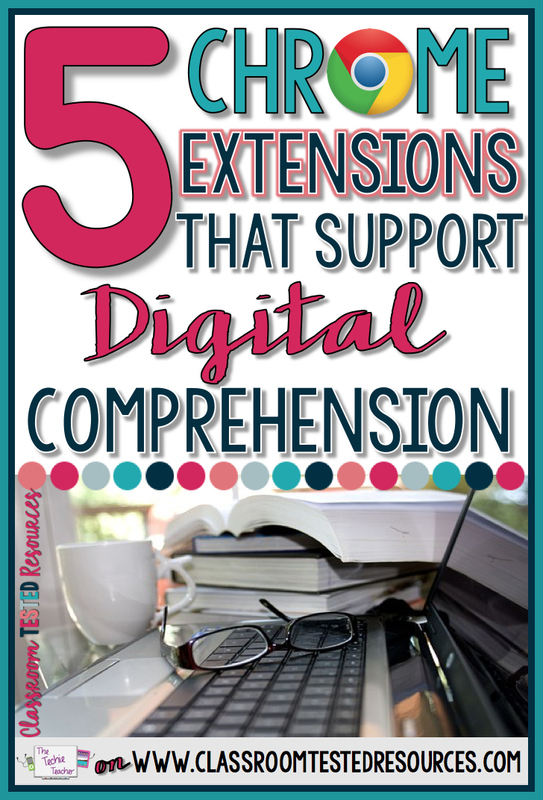 Think of those highlighter strips you buy at the teacher's store--they have gone digital! You can change both the thickness of the highlighter strip and the color of the overlay. To exit out of the extension, simply click on the computer monitor a second time and click the blue end button. In kindergarten we teach students how to track letters while sounding out words to properly pronounce the words they read. As they become more advanced readers, we teach them how to track each word as they read it in a sentence. Any child who skips words/phrases has a hard time making sense of the text. Visor helps our digital readers in the same exact way while also reducing the visual noise on a webpage! Read Mode is a very simple extension that takes any webpage and turns it into an easy-to-read black and white page. The "busyness" of a webpage is eliminated. Students who get easily distracted truly benefit from using this extension. 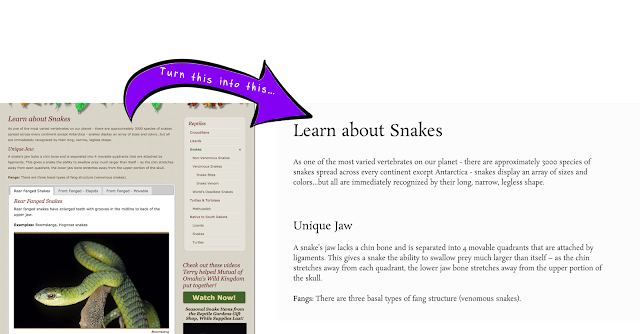 If they start reading the first sentence of a webpage and then glance over at flashy ads, buttons, and other distracting images, their comprehension will immediately be affected. They can quickly toggle back and forth between the Read Mode view and the webpage view. 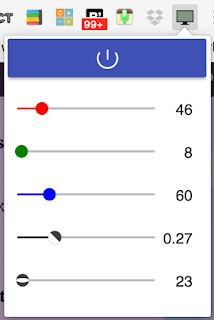 Page Marker is one of my favorites and EVERY teacher needs to have this one installed on their Chrome browser. This extension allows you to write & draw on any webpage. 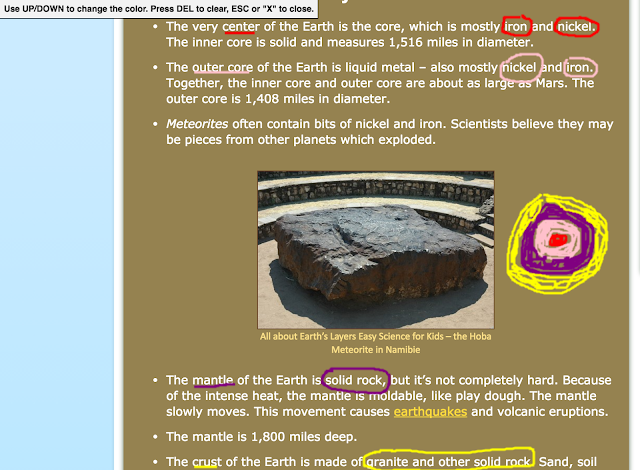 Take a look at the webpage below that a child was using to research Earth's layers. She was able to underline, circle and box key information as well as draw a diagram of Earth's layers that goes along with the text. That's it! I use this extension ALL OF THE TIME when I am trying to point something out to my students that is projected on the board when we are on different websites. Annotating and drawing pictures (especially using different colors) around text helps students comprehend what they are reading. Once you leave the webpage you have worked on, the ink will vanish. If you would like to keep your work, simply take a screenshot like the image above. 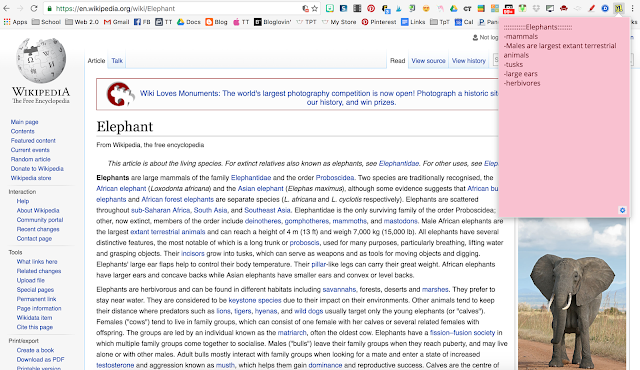 GoodWordGuide is an dictionary extension that works like a charm. Install it one time and it will work on any webpage by simply double clicking on a word. For instance, if a child was reading the webpage below about The Water Cycle and they are not familiar with the word mammoth, all they do is double click on the word and this dictionary page pops up that gives them all sorts of information about the word as well as pronounces the word when the speaker icon is clicked. Vocabulary plays a major role in reading comprehension. If a child is not familiar with a word, he/she might have a hard time understanding the entire context. 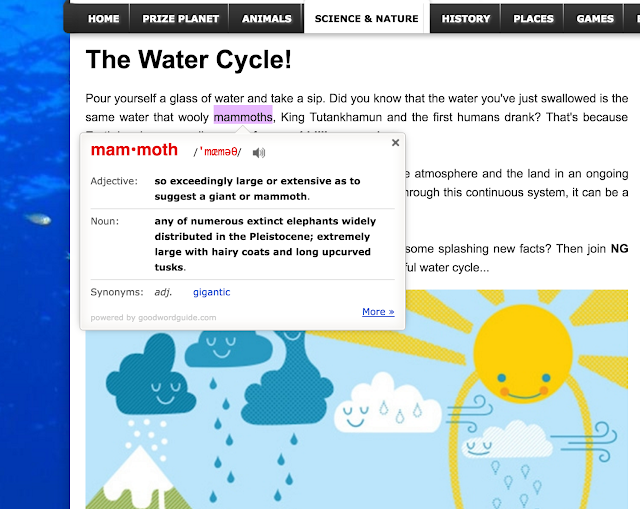 Now vocabulary instruction is just a double click away! 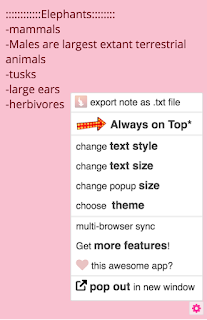 Sticky Notes is a fast, secure and private extension for taking notes. I use this all of the time to remind myself of various tasks I need to accomplish. Students can use this one to type quick terms/key ideas they find in the online texts they are reading. 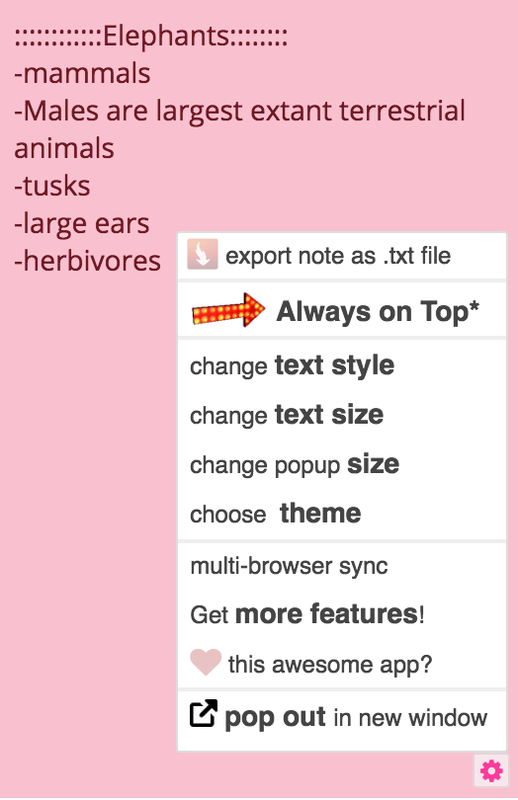 What is super awesome about this extension is that it KEEPS all notes until you manually delete them. Therefore, you can close out your browser and it is still there when you come back! Click the gear icon in the lower right hand corner to choose the color of your sticky note by clicking Choose Theme. You can change your text style, text size and the size of the sticky note. If you would like to download and print your notes, simply click on export note as .txt file and click print this note.